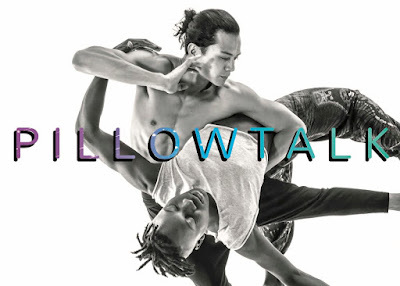 InfiniteBody: Kyoung's Pacific Beat presents "PILLOWTALK"
Kyoung's Pacific Beat presents "PILLOWTALK"
If PILLOWTALK were a streamable series, I would so binge-watch it. This short two-hander written and directed by Kyoung Park (Kyoung’s Pacific Beat) has that all-essential factor that gets me every time--people I can give a damn about. That would be Buck (JP Moraga), an Asian-American journalist just fired from the job he hates anyway and who avoids telling this news to his super-practical husband Sam (Basit Shittu), a Black man and former competitive swimmer now working for a bunch of Republicans, the only job he says he was able to find. From beginning to end, and even through the inevitable tension and dissension, Moraga and Shittu subtly radiate the genuine, consistent humanity and appeal in their characters. The romance of Buck and Sam, two contemporary Brooklynites, reflects true complexity and sweet affection in equal measures. I believe in them and root for them. Co-presented by Park's company and The Tank for The Exponential Festival, the show delves into issues of racism--even inside relationships between people of color--as well as economics, gentrification and political strategy. Most notably, Park probes the issue of how the fight for marriage equality might have robbed queer marginality of its unique, revolutionary bite. His tight, energized writing, deftly linking political and personal issues, contains no waste material. It's all hard at work all the time, and keeps both the actors and us viewers on our toes. Setting up in the smaller of The Tank's two spaces contributes to our sense of the couple's vulnerability. The tiny black box space and its ingenious, minimalist decor (by Marie Yokoyama) suggest the cramped existence of real-life New Yorkers similar to Sam and Buck. When challenges emerge in this marriage, the men retreat to an even narrower slot of territory on opposite sides of the space, or one might flee the space entirely. Their apartment's un-cozy spatial constraints are as real a worry as the external, invading pressures from community and society. But we also feel the spirit of love in the air. And that's underscored by the final sequence, a pas de deux choreographed by Katy Pyle (of Ballez fame). Moraga, whose character longs for a new career as a ballet dancer, more clearly resembles someone with ballet training (those feet, that line). I don't know about Shittu, and neither man's bio reveals a history with dance. But Pyle's work as the creator of the inclusive, queer-friendly ballez approach to classical dance upends what we expect, re-purposing and opening up all of ballet's strengths, beauty and fun to people of all genders. Her sequence for Sam and Buck strips away all the external and internal static and reveals what matters and what endures at the heart of this relationship. LOVE’S POWER/MICROINVISIBILITY (Thursday, January 25, 8pm) sheds light on the aggressions and invisibility of QPOC love. What are the spiritual and material dimensions of QPOC love? What are our acts of radical love? Facilitated by Stephanie Hsu with Guest Speakers Nic Kay, Kirya Trabor and more to be announced. PILLOWTALK continues through Saturday, January 27. For information and tickets, click here.